My name is Daniel Renkel. I passionately create indie games. Please read my blog, view my portfolio and my panoramas. 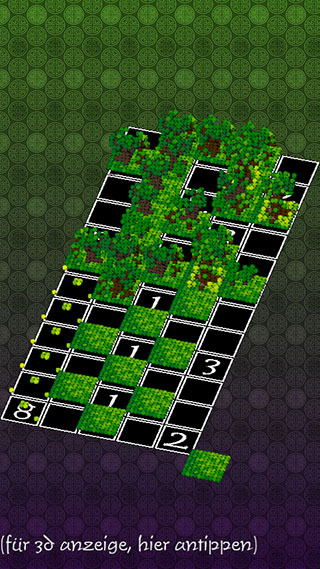 My first game for Google Android Mobile Phones. Ever helped a princess in the far east? Here is your chance! 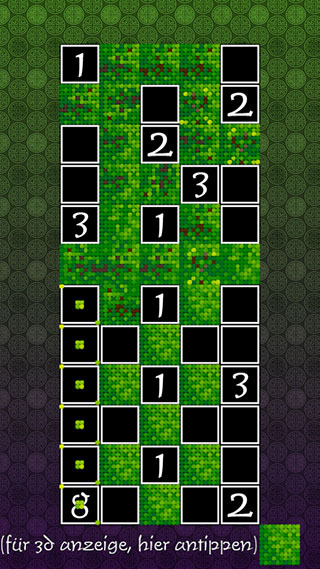 Princess Nuriko is a puzzle game with similarities to Sudoku, Minesweeper and Picross. 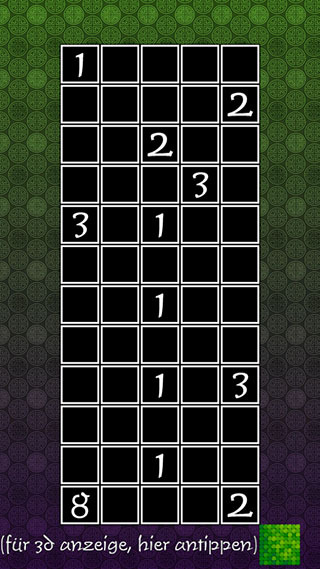 Play carefully designed nurikabe puzzles from easy to hard. 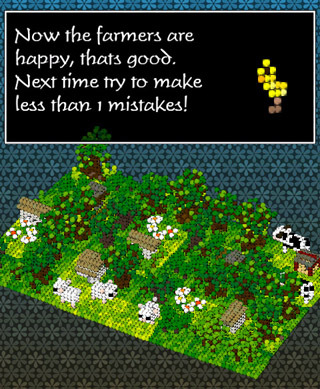 Finish each puzzle to see tiny farmer-villages grow in 3D. This is the map screen where the game starts. select a level to play it. Once upon a time ... games had story-screens! 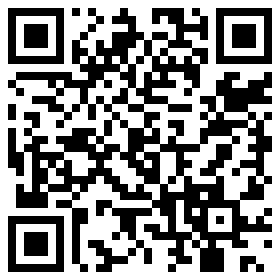 Find both demo and buyable full version of the game via this Android Market search! Princess Nuriko is the name of the game, but its also the main character. The player herself. Nuriko is her first name, she is the daughter of King Sausan. A mother is never mentioned, maybe she died earlier, maybe she is never present due to her role to re-present the king with officals. If Nuriko has a mother, then she was always kind and well spirited, but loyal to work for the country, for the people. She loved her children but duty to the folk is more important. Nurikos father is King Sausan. Its unclear if its the first or last name, it doesnt matter. He is a important figure, a good king in its classical sense. A monarch but nearly like a well voted democrat. He has a huge kingdom and its hard to control everything, but he tries. People love him for that. He is rarely home, has a distant role towards his children. His oldest daughter Nuriko will be the Queen of the kingdom in the future, he is sure she will do her best and fulfill her role, her tasks, her job well. 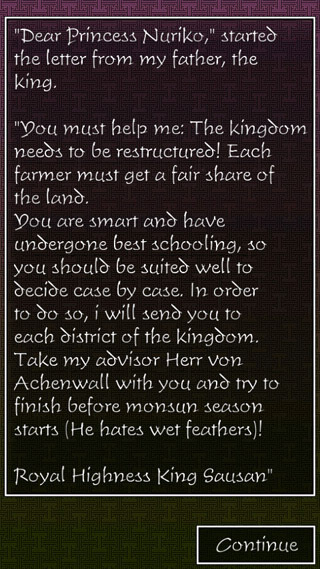 Herr von Achenwall, is one of the kings Advisors. He has german origins and is broad in his knowledge. He may as well be social-, military-, law- advisor. The king trusts him fully and puts his daughters future into the advisors hands. Herr von Achenwall is an animal. He is a canary bird. The game world is realistic, subtle, not to comic. But still its just normal and not unexpected that Herr von Achenwall is a bird. Its just as it is. No explanation given. None needed. He is yellow as most canary birds. My simple voxel visualization does display him just as the bird. But in reality he may wear the cloths of an Advisor, or maybe a sash as a represant of the kingdom. Herr von Achenwall is very smart, and expects so from others. Atleast from those he can clearly and without mistake identify as smart - like he does with the Princess. He can act very impatient on those he expects to be smart, and will always expect them to give their best. On woman he is a bit more friendly, especially on young children. He has seen Princess Nuriko grow over the years and is as fond about her becoming a young woman as her father the King may be himself. Princess Nuriko is a shy girl. She has seen the greatness her father does to the kingdom, to the people. She is quite humble and perfectly fit for the role of a good future Queen. She has underwent a lot of schooling, learned years and years. From social etiquette to modern knowledge. Still she is a nature-person, enjoys being alone in the nature, enjoys presence of animals and plants. She has not yet searched for a male, for a potential future husband. She is at that point of age, where she will become a young woman soon but has not yet the fear of whom to select as a husband. She is not childish, but still young in her heart. Princess Nuriko wears traditional clothes, but to other kingdoms it will seem as quite unfancy and the materials seem like made for workers. But the details of craftmanship in the fabrics is very well and displays the technological richness of the country. Other people Princess Nuriko encounters in the game are mostly farmers, maybe some military gards to protect her, maybe some goverment workers, some high ranked officials. All wear beautiful cloths but fitting for work, not to show off. 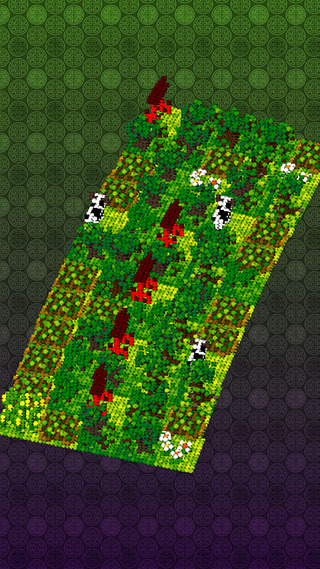 The game visual style (voxel for the tiny 3d landscapes) and the background patters is meant to look like woven clothing material. Its about the spiritual freedom repetitive work gives. But work with a higher goal, like creating nice clothing; sewing and embroidering; like solving puzzles. 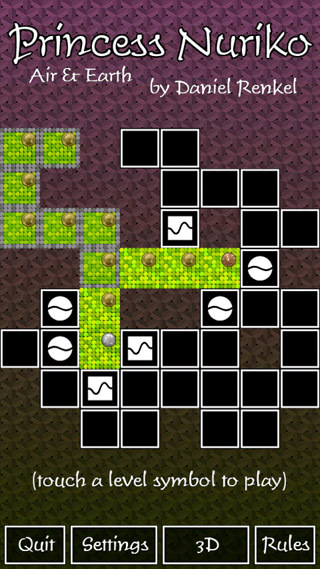 Its meant to relax your body, while you use your brain to focus on nonsensical puzzles. A way of cleaning yourself from stress. I have no idea how much i want a story line and dialogues in the game. The characters, if there are multiple dialogues, should be helping the player to enjoy the game; not show off to much. This is not a game about story or characters, its about enjoying the puzzle gameplay. Its not about unsolveable hard puzzles, once the plaeyr understands the difficulty is actually quite nice and only easily ramping up. The game is helping all kinds of players, by having a world map that makes it possible to play different levels of different difficulties. Once a player is stuck on a level, he can choose to continue playing an adjacent level. The game map is meant to look like the map of the kingdom, with some symbolical landscape like mountains in the north, steppe grasslands, greener lands and in the future i might add a southern area with a more tropical climate. The game is set in a fictive fantasy asia. One that could be china and japan and korea and india and tibet and mongolia, all in one. Its not meant to be copying these countries, its not meant to involve deep political thoughts or mirror some aspects of real politics. Its just meant as a way to enjoy the setting and details of asia. The game is intentionally shallow in a positive way. Friendly invitating the player to enjoy without complications. A follow up game for Princess Nuriko will be created in the near future. This game will most likely called Prince Kurik and the setting will be generally North Africa / Egypt / Middle East in a way similar to Princess Nuriko. All content copyrighted - Do not use in any context without permission. Graphics & Website Design Copyright (C) 1996-2011 Daniel 'sirleto' Renkel / Ludocrazy Games. Some screenshots and graphics are copyright of their respective owners.